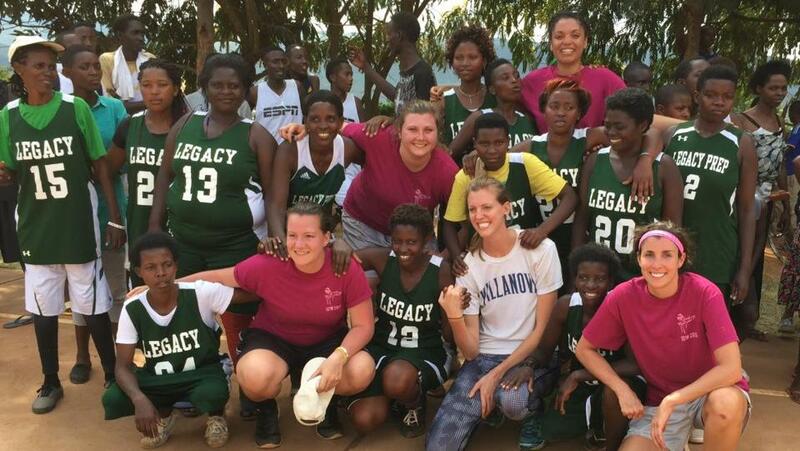 In March, Reading High grad Justine Lyons (bottom right) went to Rwanda with her colleagues from Shooting Touch to spread the word on basketball. By day, Justine Lyons is a registered nurse, working in the medical intensive care unit at Massachusetts General Hospital. The game of basketball, however, remains very much part of her life. A 1,000-point scorer, team captain, and Globe All-Scholastic her senior season playing for Kim Penney at Reading High, Lyons was a scholarship player at Saint Anselm College. An East Boston resident, she still gets together with her college teammates on a regular basis and they play basketball once per week. 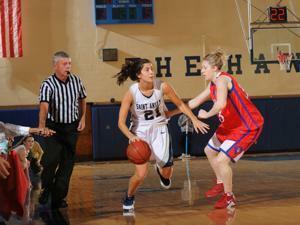 Justine Lyons (left) was a four-year player at Saint Anselm. She rooms with her younger sister, Jackie, also a 1,000-point scorer at Reading who played collegiately at New Hampshire and Merrimack. But her involvement with the game extends beyond lacing up the sneakers once a week. Lyons is a program director for the Boston-based Shooting Touch, a nonprofit that uses “the power of basketball to educate and empower young people around the world. One of her college teammates, Megan Howard, is also a director. Last month, Lyons and a group from Shooting Touch, including members of the Noble and Greenough girls’ basketball team, spent two weeks in Rwanda and helped run a basketball tournament for youth. A sociology major at Saint Anselm, Lyons went back to school, earned a bachelor’s degree in nursing from the Massachusetts College of Pharmacy, and has been a nurse since 2011. “Basketball has given me everything in life with the people I’ve met and the connections I’ve made,” she said.